Rock oversees the aftermath caused by DarkLord’s machinery which involves mainly the fusion of aspects of Darkworld with parts of Earth. He stands over the half of DarkLord that came through the portal and is soon joined by Super-Tough. The veteran hero had sometimes wondered if he would ever see the end of his arch-enemy and is relieved that their rivalry is finally at an end. Rock points out that there are still some lingering problems including duplication of people from both Earth and Darkworld as well as some of the Demon Dogs having made their way through the portal. Rock also declares that he has every confidence that Dragon will somehow find his way off of Darkworld before it blows up. Dragon goes to the site where Rapture had been killed so that he can know for sure that she was dead, her skeletal remains giving him the proof he needed. He talks about Rapture to Smasher, stating that although their relationship had ended they still very much loved each other. Dragon laments over not getting the chance to say goodbye to his former girlfriend. The two heroes are unaware that they are being stalked by Rakkum who plans to kill them both in order to avenge the death of DarkLord. He is confronted by his former captives the Eternal Youths who broke loose of their cell when the power failed. They take great delight in beating down the villain as payback for everything that he had put them through. She-Dragon awakens in her hospital bed and declares to Howard Niseman that she must save her friends from another realm. Howard is accidentally struck and is sent flying into the wall, knocking him unconscious. Dragon and Smasher race across Darkworld’s version of Chicago on their way towards Lake Michigan. The flying saucer that the government discovered beneath the water is hopefully still underwater in this reality and Dragon sees it as the only way for them to survive the planet’s destruction. He hopes to make amends for DarkLord’s actions and locate this world’s version of Rapture so that he can bring her with them back to Earth. Meanwhile on Earth, Frank Darling is working in his home office where his wife Mildred comes to check on him. He reveals that there is still no trace of William Jonson and Rita Medermade since they went missing. The Vicious Circle has been liberating super-freaks through the use of their miniaturised colleagues and are now nearly up to full strength. Frank’s search into Dragon’s origin has brought up only dead ends, albeit interesting ones. All of the languages that Dragon knows are ones that are broadcasted on television while his knowledge of written language is poor. His knowledge seems to come completely from five days’ worth of television broadcasts but he cannot comprehend who would erase Dragon’s memories and then replace them with such items. Back on Darkworld, Dragon goes in search of Rapture and speaks to some of her former prostitute friends. Instead of locating Rapture, Dragon instead comes across Debbie Harris who remains alive and well in this reality, although she is clearly a drug addict. 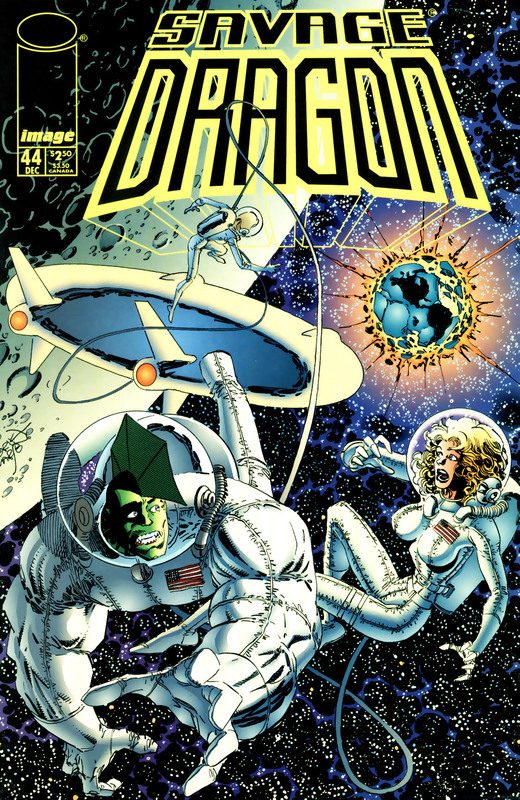 With time running out, Dragon opts to abandon his original search and instead takes Debbie with him to the flying saucer. He barely misses this reality’s Rapture who arrives just as he is leaving. Dragon introduces Debbie to Smasher before they all board their alien vessel and take off, mere moments before Darkworld explodes. They had stolen supplies from a truck and a store which should last them for the duration of their flight. Dragon’s experience with Martian technology enables them to set a course for Earth’s true location but their journey will take a few months. The destruction of Darkworld has an instant affect on She-Dragon as the voices in her head suddenly vanish. She explains to Howard how she is alone again as he now recovers in a hospital bed from the injuries that she accidentally inflicted upon him. Howard declares that he is going to have her kicked off of the force but She-Dragon mentions how it would look if he admits to being beaten up by a super-freak, and a girl one at that, to the rest of the world. As the flying saucer voyage continues on, Smasher explains to her new companion about how she ended up as part of the S.O.S. She recites the story about how she married her high school sweetheart but this loving relationship quickly turned to an abusive one. Jennifer Murphy’s mutant powers began to kick in and she no longer felt any pain from her beatings. This frustrated her husband who went to take out his frustrations on their daughter. Jennifer struck out at him as the rest of her abilities manifested and her strength instantly killed her husband. She was then framed to look responsible for the murders performed by a super-powered serial killer. Dragon assisted in clearing Jennifer’s name and then when he was forming the S.O.S., she accepted his invitation to sign up. A funeral service is held for Rapture where many of her friends show up to pay their respects, from her teammates in the S.O.S. to her fellow prostitutes. Barbaric overhears some of these hookers talking about how Dragon is likely dead now too but he points out that there is no proof to that story. Ricochet takes her husband away from the women before Hawkins approaches him. He sets up a meeting after the funeral for them to discuss their toy deal. The heads of the S.O.S. hold a meeting to discuss the future of the team. Rock is now leading the team and it is pointed out to him that Beast Boy and Feezle are completely useless and that GoldBrick, Crusher and Morose have recently been lost in the line of duty. Rock is disgusted that Hawkins has written off Dragon and Smasher as being dead and demands that a search takes place. Stephenson shares his concerns and agrees to the hunt. Rock introduces them to the one person that he believes can locate Dragon where no one else can, Vanguard. Back on the flying saucer, a naked Debbie Harris attempts to seduce Dragon after having heard the story about her death in his reality. She hopes to thank Dragon for saving her life by sleeping with him, just as her counterpart had once done. Dragon turns down this offer as he does not believe that such a relationship would be fair to Smasher under these difficult circumstances. Barbaric is angered by the state of his new toys as his figure has been made the same size as some other smaller heroes, Stan Levi’s Leapin’ Lizards. Ricochet is happy with her action figure but Barbaric airs his frustration over the whole thing. He is annoyed that his toy line is being linked in with an already failing one and pleads with the toy manufacturers to do a good job as it is very important to him.